← If You’re Gonna Show 35…. Teachers looking for students in the wilderness. You won’t find Kurdistan on the map. But it’s very real to millions of Kurds. The region they live in has been battered by conflict for centuries, and the boundaries have shifted over and over again. After WWI Kurdistan was divided up among four neighboring countries, Turkey, Syria, Iraq and Iran. Somehow the Kurds have managed to hang on to their culture and their language in spite of this. In some areas they’ve even gained a fair amount of political and economic clout. But there are also large numbers of Kurds who live as nomads, wandering through the countryside. This life has always been difficult. In recent years, with violence erupting all over the Middle East, it has become nearly impossible. 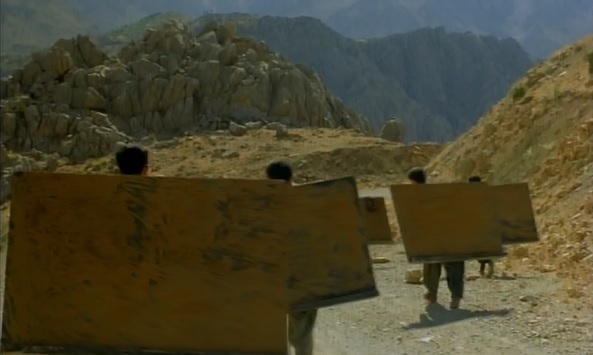 In her film Blackboards, Samira Makhmalbaf focusses on the Kurds who spend their lives travelling on foot through a harsh and desolate landscape. The story revolves around two teachers who are wandering across the mountains of Iran, hoping to find someone who will pay them for lessons. One runs across a group of boys who are smuggling contraband. The other falls in with a band of nomads who are lost in the wilderness. It turns out all of them are trying to cross the border into Iraq. It’s clear these people lead hard lives, but those of us who have always had food on the table and a roof over our head probably can’t ever imagine how much suffering they’ve endured. Makhmalbaf slowly reveals pieces of their history, giving us glimpses of the violence they’ve been subjected to, but she’s not trying to win our sympathy. She’s not trying to bring tears to our eyes. Instead, she’s opening a window on the world these people live in. Hiding until a helicopter passes. 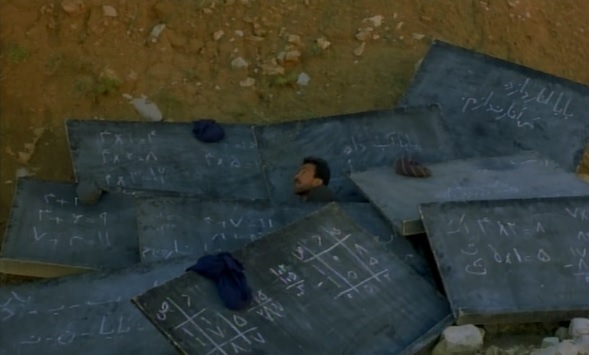 Makhmalbaf somehow manages to combine rigorous objectivity with breathtaking poetry. She’s a born filmmaker. * She seems to have an intuitive understanding of sound and image. Blackboards is wonderfully simple. We follow two groups of people walking across a barren landscape, watching their faces, listening to them talk. The mountains and valleys that stretch across the horizon, dwarfing these frail travellers, have a stark, surreal quality. They seem both brutally harsh and strangely ethereal. 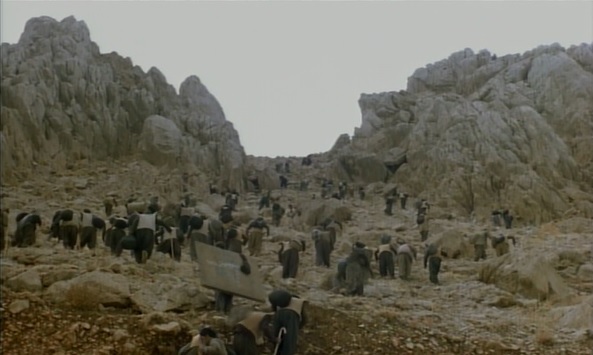 Makhmalbaf uses music sparingly, and so much of the time these people are enveloped by an enormous silence, broken only by the sound of footsteps, scuffling across the dirt, clattering over stones. The teachers are trying to sell their services, but nobody wants them. For people like this who are struggling just to survive, the idea of wasting time on luxuries like reading and writing seems pointless. An so the teachers, who start out aggressively, insisting that everybody needs what they’re offering, end up becoming beggars, following these desperate people, hoping to earn a piece of bread. At first the teachers can’t even get anyone to talk to them. Both the smugglers and the nomads are deeply suspicious of strangers. They have good reason to be. The boys make their living by acting as mules, carrying contraband across the border, trying not to get shot in the process. Having lived longer, the nomads have suffered more. They’ve persevered through years of conflict between Iran and Iraq, as well as two invasions by the US. The lone woman in the tribe is sullen and stoic. Even after marrying one of the teachers, she answers his questions in single syllables. Later we learn that she’s one of the few who survived when Saddam Hussein bombarded the city of Halabja with chemical weapons. She has no patience for useless talk. She’s too busy trying to make it through another day. And that’s all the teachers are able to do. At the end of the film, they have nothing to show for their efforts. Border guards fire on the child smugglers, and the boys run for their lives. The nomads manage to cross into Iraq, but the teacher who was travelling with them chooses to stay behind. His divorce from his wife is as simple and quick as their marriage. And she walks off toward the horizon, carrying his blackboard with her. Wandering endlessly through an unforgiving landscape. The fact that she’s the daughter of Iranian director Mohsen Makhmalbaf might have something to do with it. Maybe it’s just in her blood. Posted on November 28, 2014, in Uncategorized and tagged Samira Makhmalbaf. Bookmark the permalink. Leave a comment.